You claim that your software can calculate an area. This is the application I need because I have a GPS receiver that does not calculate area but if I understand correctly I can mark different waypoints in my farm (not a perfect square) and then download them to your software and then I get the area? Do I need a topo map of my farm to do this??? Please forgive my ignorance but I just need an application that would allow me to know exactly the area in a big farm that may have for example, corn or soy, etc. How do I Calculate the Area of a Farm Field? 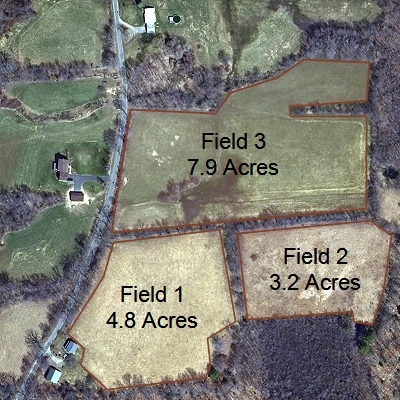 The first step is to bring up an aerial photo of your farm. Download and install ExpertGPS, and start the program. Click Go to Address on the Go menu, and type in the address of your farm. ExpertGPS will recenter the topo map on your farm. Click Show Aerial Photo Map on the Map menu, which should give you a pretty good view of your fields. Now we’re going to trace a field. Select the Track tool. Click once on the corner of your field, and continue clicking at each corner, working your way around the field. The track tool draws straight lines when you click. If there’s an irregular edge, along a road or creek, click and drag the mouse, tracing that edge. When you’ve traced your way around the entire field, press Enter to finish the track. Name your field, and click OK.
Now switch to the Select tool, and click on the track of your field to select it. Right-click, and click Close Track. This tells ExpertGPS to treat this object as a closed shape. You’d use this command any time you were drawing a field, paddock, or stock pond. On the left side of the screen, switch to the Track List. Click Select Columns on the List menu, and make sure Area is checked. ExpertGPS will calculate the area of your field (and all the other closed tracks in the Track List) and display it. If you need to switch between acres, square feet, hectares, or other units of measure, click Preferences on the Edit menu, and change the Distance Units. Another way you could trace the boundaries of your field would be to take your GPS out and walk or drive the edge of the field, recording a GPS track. Back at your computer, click Receive from GPS, and ExpertGPS will bring in the track outlining your field. Follow the directions above, starting with Close Track. If you have previously used your GPS to mark waypoints at the corners of your field, click Receive from GPS to bring them into ExpertGPS. Switch to the Route Tool, and click on each waypoint to connect them together into a route which traces the boundaries of the field. When you are done, select and right-click on the route, and click Close Route. Proceed as above to enable the Area column on the Route List. Update – December 17, 2008: ExpertGPS User Bob C. asked a follow-up question: “How can I label an object on the map with it’s area?” Here’s what I did: I looked in the Area column in the Track list (as described above) to find the area that ExpertGPS calculated for that field. I then selected the field, clicked Edit Track, and entered Field 3\n7.9 Acres in the field’s Label. The backslash-n (\n) is a special command that causes ExpertGPS to insert a newline, making Field 3 and 7.9 Acres appear on two separate lines. Ask the GPS Expert: How do I determine the acreage of a field covered by a center-pivot irrigator? How do I calculate area with a GPS? I used a blackberry set to record GPS coordinates of my farm, is there a way I can enter them manually and then determine the acreage of the land? Paul, you can use the New Waypoint command in ExpertGPS (on the Tools menu) to enter the coordinates for each corner of your farm. Then, follow the directions for “Calculating Area of a Field Marked with Waypoints” above to create a route around the outside edge of the farm and calculate the area. How do i go about using my Garmin etrex Hcx to measure distances and area on the ground? Follow the instructions in the article – either mark waypoints with your eTrex, or walk around the perimeter recording a GPS tracklog with your GPS. When you upload your GPS data to ExpertGPS, you can then connect the waypoints into a route, and display the area, or look at the Area column in the Track list to see the area enclosed by the GPS tracklog.